Making delicious baked goods without a ton of calories is difficult. Sure, you can leave out butter, sugar, and eggs but then it isn’t delicious. This cake takes the approach of replacing the butter with other flavors – lemon and blueberry. The idea here is that lemon and blueberry are SO tasty that you won’t miss the butter. Also, I used white whole wheat flour instead of all purpose flour to add more nutrients. This made the cake a bit less fluffy and its texture reminded more of a muffin. I would not serve this at a 3 year old’s birthday party. 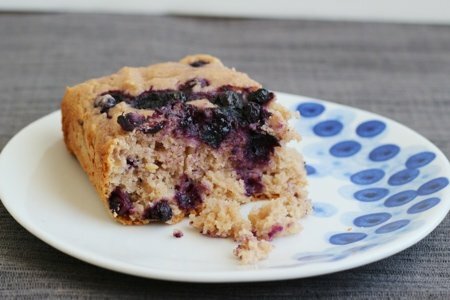 This is a very low fat cake and it may help you avoid the evil “25 grams of saturated fat blueberry muffin” that lurks at your favorite Starbucks or café. If you eat those super fatty muffins (and I had a habit of eating them myself), remember this might take some getting used to – but it is worth it in the end! How do you make lower calorie baked goods? Preheat oven to 350 F. Line a 8x8 inch square pan with parchment paper and spray with non-stick spray. Combine milk, lemon juice, yogurt, egg, lemon zest, and vanilla in a large bowl. Add flour, sugar, baking powder, salt, and blueberries and mix until blended. Spread batter in pan and top with 1/3 cup blueberries. Bake for 45-50 minutes until a toothpick or butter knife inserted into the center of the cake comes out clean. Top with powdered sugar or eat plain. All right! I rarely keep yogurt around because I don't care for it by itself, but is gotten some recently for baked goods and love using it that way! Looks like an excellent way to make use of what I have left. To cut down on fat and calories in baked goods I typically substitute unsweetened applesauce for oil, use egg whites, and use fat free no sugar yogurt for butter. Usually works pretty well! Why would you use parchment paper and a nonstick spray? Could you make this with orange juice/zest and frozen cranberries? I don't eat sugar, so I would substitute monk fruit for the sugar, or just not bake. I usually don't eat desserts. Beautiful! If this is anything like what I'll find in your upcoming book, I can't wait to get it. Alas...the kids did not like it because of the whole wheat flour. *Sigh* darn you, nasty packaged foods that have ruined their palates! We did add plenty of powdered sugar or honey when on the plate to sweeten it. Sent in what was left of the warm cake for the teacher. @Christopher - I used both because I was afraid that the lack of fat would make it stick. Perhaps just parchment paper would work. @India - I LOVE that idea - orange zest and cranberries - gotta try it. @Katie - oh yeah. My book has some great ideas for lower calorie baked goods! @Jennifer - next time try 1/2 whole wheat and 1/2 all purpose. I bet they will like that better. It takes time to change taste buds! Thanks for trying the recipe and sending the feedback. Lisa, could I use fresh blueberries instead of frozen. I have fresh on hand today and would try if this would work. Looks fantastic! I am just wondering if fresh blueberries could be used in place of frozen ? Use the fresh ones - even better!!! Great question. Wondering if you can use a sugar substitute (ie. Splenda, stevia) or will it affect how the cake rises? I love making super-thick homemade applesauce and substituting that for butter and some of the sugar in a cake. Adds tons of flavour!! Well,I tried today with the fresh blueberries and did turn out really nice, however, I thought it needed a little something else in the ingredients. It didn't seem to be very tasty at all. Probably will not try again unless I can think of something extra to give it more flavor. Seemed very bland. Of course, we do get used to the real things don't we. Sorry on this one. Have to apologize. I tasted when it was still warm and that was my first impression. Now after has cooled it is quite good. I will not be making any changes. Maybe add just a bit of cinnamon. It is quite tasty after being cooled down. Will make again. This cake sounds divine. Why on Earth would you not serve it at a 3-year-old's birthday party?